Welcome to the new American dream! 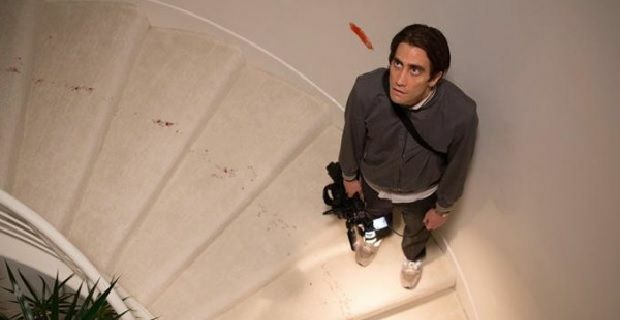 It can be said that Dan Gilroy’s Nightcrawler is to the 2010’s what Mary Harron’s American Psycho was to the 1980’s. In fact, it’s kind of a shame that title was previously taken as this film could easily have carried it. This film begins and ends on the shoulders of Jake Gyllenhaal and he carries it with an unrelenting seriousness that is at first endearing and humorous, but finishes as something completely different. Gyllenhaal’s character, Lou Bloom, is the perfect embodiment of what the American dream has evolved into: get your shot no matter the cost. To a world that is infatuated with the grotesque underbelly of American society (I’m looking at you, reality TV viewers) this movie is like a mirror. We watch the deplorable behavior of the sociopathic lead character and recoil in its weirdness and disturbing lack of conscience without realizing that we gleefully devour the kind of footage he schemes to get and thus we are the reason the footage has so much value. If people didn’t watch the type of videos Lou Bloom films there wouldn’t be a market for it. Plain and simple. There’s a line in the film when Lou’s sidekick, Rick (played by Riz Ahmed), has had enough of his behavior and tells him “You don’t understand people”. Lou takes this admonishing without comment. Later in the film, Lou eventually fires back “What if my problem wasn’t that I don’t understand people but that I don’t like them?” In watching him manipulate people scene after scene we learn that Lou understands people quite well, better than most people, and in all honestly he hates that he needs them. He uses Rick as well as the TV news director, Nina (Rene Russo), to get ahead in his business. From the outset Lou has a business plan, he simply doesn’t have a business. But when he finds out he has a knack for manipulating both people and the reality in front of his camera, he goes all-in and his success steadily increases. What is also interesting is the character of Nina. She is not so different from Lou, though she lacks his manipulative ability. Knowing full well that what Lou has filmed has broken moral and legal codes does not stop her from airing it, and therefore she feeds into his behavior as much as the rest of us. Nina is, essentially, a proxy for the public’s viewing appetite. Her mantra about the news is to think of it as “a screaming woman running down the street with her throat cut”. That’s what sells because that’s what people will watch, and both of these characters understand this. Russo is really great in this part. This film is very dark and not likely for everyone, though I found many moments encased in black humor. It’s beautifully shot and the score is great with some tremendously thrilling music underscoring some of the more active scenes, including car chases and such. Gyllenhaal was robbed of an Oscar nomination for sure as Lou Bloom is quite an exquisite creation, though at times he’s a bit one-note. As a driven, ambitious character he’s right up there with the most insidious, sociopathic characters ever put on film. I found myself both disgusted and rooting for him at various times throughout the film, which is definitely a testament to the character and the writing of Dan Gilroy.